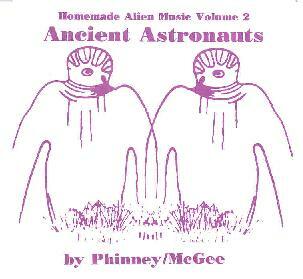 Phinney/McGee - "Homemade Alien Music Volume 2: Ancient Astronauts"
For Ancient Astronauts, Chris Phinney and Hal McGee combined their respective arsenals of electronic gear to produce over 70 minutes of pure space music, atmospherics, noise, and fun sounds. I won't even try to list the equipment each used but suffice it to say that this is analog synth heaven. By way of introduction to the music I should mention that each copy of the Ancient Astronauts CD comes with a very cool comic book titled... you guessed it... Ancient Astronauts!! Monsieurs Phinney and McGee are on the cover suited up and strapped into the seats of their flying saucer which they navigate with moogs and theremins. Our heroes travel (at 91 million miles per second) to the planet Earth where - they being the Ancient Astronauts - they visit the Mayans, the Druids at Stonehenge, and become the likenesses for the pyramids. Basically this well researched work fills in the cracks left open year ago by Von Daniken. All the track titles represent different stages of the story told in the comic book. The atmosphere is, for the most part, cold and dark throughout... but so is space itself. The disc opens with our heroes leaving their home planet of Sono. On "Through The Inter-Dimensional Portal", wails, washes, and drones set the tone for our travelers' journey. I like the way varied synth lines are slowly phased giving the feeling that we're twisting and turning through space. This same effect is heard again on "Return Of The Star People". A heart thumping cosmic drone keeps the pace as lots of spacey bleeps and blurps dance about. The drone is relentless and when the phases kick in it's a bit jarring. The volume increases steadily and I think I now know what it must have felt and sounded like to be present in Close Encounters as the mothership was descending from overhead. Two of my favorite tracks are "Chichen Itza" and "Crop Circles At Stonehenge". "Chichen Itza" features harsh, brain searing electronics that forced me to take off the headphones... I'm way to close to this ship's engines. But even though I ended up with my brain fried, this isn't just a massive wall of noise. All the sounds are still detectable and distinct from one another, which is important for me with this kind of music. "Crop Circles At Stonehenge" is like the daily operations of an industrial space factory. The pace and central theme are fairly static throughout. But there is a continual parade of sounds, like the goings on at the factory, or the everyday sounds of a bustling urban metropolis. But Ancient Astronauts does have it more peaceful moments. "Tiahuanaco" and "The Great Pyramid" are the two examples on the disc of mind soothing ambient space music. And "Silver Disks Over The Jewelled City" is a calmer track as well, but with no shortage of freaky synth noodlings. In summary, far from being an ambient form of floating electronica, Ancient Astronauts is a busy work in the sense that there is usually too much going on for it to be meditational in any way. Certainly there's ambience, but the cold mechanical atmosphere works well and listeners who are attentive to aurally exploring all that the music reveals will be rewarded. Each subsequent listen uncovers new little passages, sounds, and atmospherics making this an overall enjoyable experience. Highest recommendation to fans of cosmic electronic space music. CLICK HERE to return to the Chris Phinney / Harsh Reality profile index page.